We all have a story to tell, don’t we? It is the story of our lives. It tells where we came from, where we have been, the people we have known, the things we have experienced and felt, where we have lived, the things we have done, both bad and good, the lessons all of this taught us, and where it all has brought us today. If we are followers of Jesus Christ, part of this story, or all of this story has to do with what brought us to faith in Jesus Christ, the journey of faith that followed our decision to follow Christ with our lives, and where we are today. Some of us stayed the course the whole time, while others of us strayed for a period of time, but then were brought back to a right relationship with our Lord. And, some have strayed, but have not yet returned to purity of faith in their Lord and Savior, Jesus Christ. Well, this is my story, as the Lord is leading me to share with you today. one week each summer at summer camp at Beulah Beach Camp in Vermilion, OH, which is not far from Cedar Point, in Sandusky, OH. And, it was there, during an invitation at the end of one of our worship services, that I cried my heart out to God, repented of my sin, and turned my heart over to him, making him my Lord and my Savior. Although I was only 7, I knew the weight of sin, for I was being abused physically, emotionally, mentally, sexually and spiritually by my dad. He was a user and an abuser who beat up on and who took advantage of those weaker than him. My father was the epitome of Satan to me, and I was scared to death of him. He wielded enormous power and control over my life. I truly hated the evil he was forging against me and my family. So, when I was crying out to God, to Jesus Christ, I was also crying out to him my pain and my suffering, looking for his healing and comfort in my heart. Then, I began my faith journey with my Lord. Because of all that I was going through with my dad, who touted legalistic Christianity while he was living a lie, I wanted no part in what was fake or in just going through the motions. I took God and his Word dead seriously, often to the chagrin of my peers and some church leaders, too. I wanted a relationship with Jesus Christ that was genuine, honest, biblical, and that was pleasing to my Lord. And, so I drank in the Word of God, sitting on the front pew in church, listening to every word preached with great intention to live what I was being taught. In high school I was president of my school’s Youth for Christ Club, and I was actively involved in teaching backyard Bible clubs through Child Evangelism Fellowship. In college I was involved with Intervarsity Christian Fellowship and with my college Sunday School Class at church. I also sang in the choir at church and sang solos or duets or trios or in ensembles. I was serious about my Lord, and I was serious about following him with my life. I certainly wasn’t perfect, though. Because I had been abused by my dad, and emotionally neglected by my mom, I was starving for love and affection, but the only real affection I had known was the wrong kind, with my dad, so this made me particularly vulnerable in that area, wanting to be held and loved, but in the right way, but susceptible to allowing affection in my life in the wrong way. So, in my dating experiences in college, although I first stayed at an arm’s length from guys, and would not even hold hands with anyone, I eventually caved to the pressure to be physically promiscuous with just a few, including with my husband, who was not my husband at that time. I left the home of my parents at the age of 22 to unite with my husband in marriage. And, we have been married 45 years. I thought my husband was not at all like my dad when I married him, but over the years I began to see similarities between him and my dad, and eventually I realized that, essentially, I had married my dad, although I don’t think I fully comprehended to what extent until recently. I loved (and love) my husband very much, and he was my best friend, and I still desire to have that kind of relationship with him. But, we have had a rocky road, for he brought lust addiction into our marriage, and it has continued over the course of our 45 years of marriage. My husband and I, from early on, though, were involved in Christian ministry together, teaching or leading Bible studies, youth group, Sunday School Classes, and the like, as well as we sang together in church. And, a couple of times we were involved in church planting, but both of those attempts failed. Recently he professed to have trusted in Jesus Christ to be Lord of his life, realizing that Jesus never was his Lord, and that he had been running his own life all these years, walking according to the flesh, and doing what his flesh desired, no matter who got hurt in the process. So, now he is working toward recovery from his lust addiction and to changing his life course. I am not seeing a dramatic change in his life, yet, but he is treating me nicer. Yet, over the course of our 45 years, by his own public confession, he, like my dad, was a user and an abuser who took advantage of others in order to feed his own lust addiction and in order to feed his own flesh. And, there was a short period of time in our marriage, where he led me down that path with him, and I joined in with him in his hypocrisy, in his thirst for lust, and I participated with him in sexual immorality, too. But, then the Lord led me to the point, again, of hating this evil, and wanting out of it, once and for all, never to go down that path again, and that is what happened. I closed that door on my former life, I trusted in God’s sovereignty over my life, I took up the armor of God with which to fight off Satan’s evil attacks against me, I set my face like flint, and I began a new journey with my Lord. It was two years after I shut the door on the evil, that I had previously allowed into my life, that God called me to this present ministry. That was in 2004. Since then, he has been revealing himself to me in ways I had never known before. His light began to shine into my life, too, in ways I had not ever experienced previously. He began to teach me so many things about what was going on in the world, and how prophecy of scripture was being fulfilled in our day and time, and he taught me, too, about the spiritual condition of today’s church here in America, not including every congregation, but the overall view of the church at large here in America. And, he began to open up his Word to me and to teach me so much that I never understood before from the truths of His Word, and how they applied to our world and church and individual lives today. And, then he had me share on the internet what all he was teaching me, and then he gave me songs to write, too, for the praise of His glory. And, many of them are included in what he has me write each day, too, from the teaching of His Word. But, the difference he was making in my life was not just in the realm of the ministry he had given to me, but in what he was teaching me personally, and how he was growing me in him, and how he was leading and teaching me to daily die to sin and self and to live to his righteousness. Through it all he was making me holy and conforming me to his likeness. And, the closer I got to my Lord, and the more I was involved in ministry with him, the deeper my husband went into sin and rebellion against God and against me and fought against me whenever I would confront him with sin in his life. Yet, the Lord took my pain and my suffering and he filled me with his peace and with his joy through it all. I can tell you, having been on the dark side, i.e. having given way to my flesh and yielded my life to a sinful course, for a time, and now having been delivered out of that, that this is the ONLY way to live! This, walking in obedience to my Lord, is the only way to true peace, joy, fulfillment and gladness, for HE has made me glad! I will forever be thankful to my Lord that his love lifted me out of that dark time in my life, and that he got me to that point of hating evil so much that I would never want to go back. I am also thankful to the Lord for the life experiences he gave me, that he allowed in my life, because through them he has made me who I am, and he has indelibly marked my mind and heart to hate evil, not just so I would not go back there, but so I would be passionate about taking his gospel message to the world and to the worldly church, in sharing with them the truth of what God’s Word says about sin, judgment, eternal life, and what it means to truly be saved from our sins. I give all the glory to God for everything he has done and is doing through my life. I know that what he gives me to write is from him, and is directed by him, for his purposes and for his glory, so I take no credit for myself. I know, too, that I could not do any of this without him, without his grace, his wisdom, his strength, his comfort, his healing and his power at work within me. All I am and ever will be is all because of Him. Amen! Wednesday, February 7, 2018, 5:24 a.m. – Thank you, Jesus, for directing me to write this testimony. May you use it for your purposes and for your glory in other people’s lives. If anyone is interested in reading more of my testimony, the Lord recently led me to write my story in the form of a book, I Married My Dad, which can be read here: https://walkingwounded.blog/i-married-my-dad/. God bless, you. You are in my prayers. Thank you, Phyllis. I appreciate your prayers very much. God bless you, too. Thank you for sharing! What a blessing and encouragement to see how far you have come. Praying for you and your husband. Amen, Sue!!! God is good 🙂 I loved the pictures you shared!!! Yes, God is good! All the time!! Oh, on the pictures, the Lord encouraged me to try adding pictures this time, and it worked. 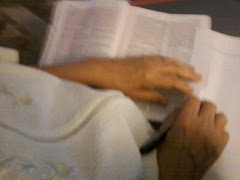 The picture of me having my quiet time with the Lord was taken by my grandson who was 5 years old at the time. He asked to use my camera, and I let him, and he just began taking random pictures, and I loved this one so much that I added it to my blog to represent my times with God each day, for that is what was happening when he took the picture. The picture of me at summer camp was ripped at the top by a fellow junior higher when I was in 7th grade. I think I took it to school to show to her. And, it has wrinkles in it, too, so it shows its age and wear and tear. The picture is about 60 years old. The one of me singing was taken by my husband when I was recording the song “For Our Nation,” here in Nashville, TN, in 2012, when we were still living in SC. And, the last one was taken on my 68th birthday in December. Our friends were with us, and we were listening to Handel’s Messiah, when it came to a part about the daughter or child of the King, or something like that, and my friend turned to me and told me I was a daughter of the King, and that was the smile on my face. The wedding picture is obvious. I liked this one especially. Happy memories. ❤ it's so wonderful learning about the origins of the pictures. I think you were a beautiful bride. Thank you! Yes, we are daughters of the King! That is very special, too!! ❤ I was just having music play on YouTube, and this song just started playing. It really speaks to me, and since I was talking to you, I wanted to share it with you. It was my friend who then said that I was a daughter of the King. Oh, no!! The song was Every Mile Mattered by Nichole Nordeman lyric video. This song was awesome! Yes, that is the point of my testimony. It is my history, but every mile mattered. Through it all God was preparing me for this moment in time when he would make me into the woman of God he would use for his purposes and for his glory. He certainly didn’t lead me or cause me to fail, but he used even my failures to make me into the woman of God he wanted me to be. So, your song just fits so perfectly here. Thank you so much for sharing it with me. ❤ praise the Lord for having it play and putting it on my heart to share!!! Amen, He is with you, Sue! And, with you, too!! Amen! !